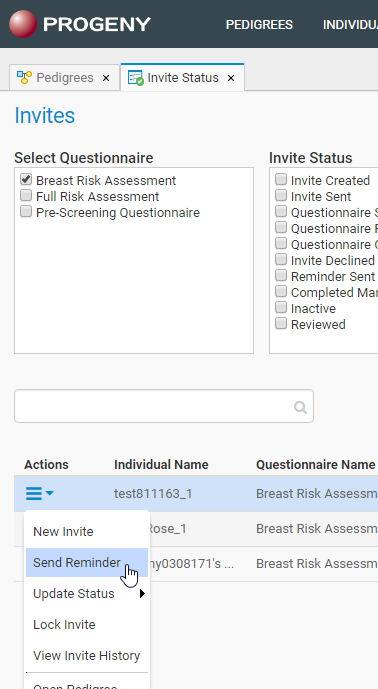 Select the checkbox next to the questionnaire in which you need to send a reminder. Find the individual in the box below who needs a reminder. Click the Actions menu to the left of the individual name and select Send Reminder. Then, make any edits to the reminder email if desired and click Send a Reminder. Click Close to close the confirmation message. Can't find your answer? Don't worry, we're here to help! Please have your 7 digit Progeny customer number ready when you begin the live chat session. Note: Only basic requests can be handled through our chat system. For complex inquires, please send us an email or give us a call.